NOTICE: This item subject to availability. This item may be sold at any time without notice, and may no longer be available. To confirm availability of this item please contact Sant Blanc. Orders placed on SANTBLANC.COM are subject to risk management, verification and approval. Sant Blanc reserves the right to refuse any order. Absolutely Stunning brilliant Rolex White Dial! This is the Rolex Yachtmaster model 16628 40mm size Yachtmaster: This is the style with heavy Rolex 18kt Gold bracelet Rolex genuine. To replace this Rolex has an estimated MSRP of $28,900. This Rolex is in pristine condition...Priced to sell immediately! 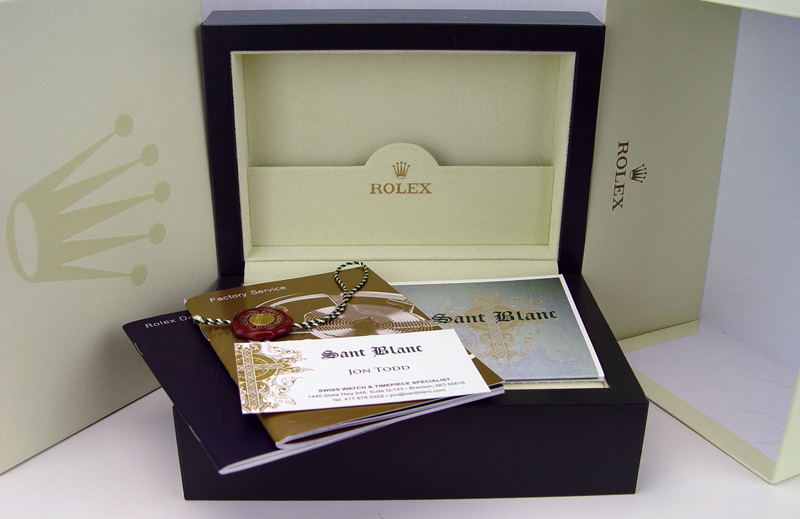 Comes with genuine Rolex presentation boxes, Rolex books, Rolex tag, Retail Appraisal And The Sant Blanc Three Year Warranty!...In pristine condition...The Perfect Gift! This Rolex is authentic and stunning. Unconditionally guaranteed to be authentic Rolex. "Please serious bidders only". I have set the reserve well below the current value placed on this timepiece. SANT BLANC is a Swiss watch and timepiece specialist and not a Rolex dealer and have no affiliation with Rolex Watch USA. This Rolex timepiece is unconditionally guaranteed to be authentic. We are the sole warrantors of this timepiece. For questions please contact this telephone number 417-676-0322. Authentic Rolex. It does not get any better than this! Pictures do not reveal the radiant beauty of this timepiece. This Rolex is authentic and stunning. Unconditionally guaranteed to be authentic Rolex. "Please serious bidders only". I have set the reserve well below the current value placed on this timepiece. I am a Swiss Timepiece Specialist and not a Rolex dealer and have no affiliation with Rolex Watch USA. This Rolex timepiece is unconditionally guaranteed to be authentic. No factory warranty attached. We are the sole warrantors of this timepiece. For questions please contact this telephone number 417-676-0322. The winning bidder must contact us within 2 days and payment must be received within 5 days of the close of this auction. Accepted forms of payment are Bank paypal Echeck Transfer, Check, Bank Check, E-Check, PayPal, and all major credit cards. If you you are unable to complete payment within 5 days, you must contact us immediately by phone 417.676.0322 or contact Contact Our Office: 417.336.9180. SANT BLANC warranty is for a full three years. The dependable operation of this article for a period of three years from the date of purchase. Modification, tampering and abuse void warranty. SANT BLANC is the sole warrantor of this article, the demanding warranty no longer apply. SANT BLANC Service & Warranty Division and The SANT BLANC Service Center, services and repairs Swiss Made watches and timepieces. The SANT BLANC Service and Warranty Division has over 30 years experience as Swiss Timepiece specialist factory trained and certified "Watchmaker". The credentials include AWCI CW21 certified as one of the world's leading watchmaker. Our watchmaker is a certified graduate watchmaker with continuing Swiss Watch education including training from the Rolex Dallas Training Facility. Sant Blanc is dedicated to setting the highest standards in Swiss Timepiece excellence. We have a complete Swiss watch service center. We do our own inhouse photography, and research. Please contact us if we can be of service to you. Overnight shipping is included. This item is professionally packaged and shipped fully insured, adult signature required at delivery. We ship via FedEx, UPS, Brinks, Private Courier and United States Express Mail. Items are typically shipped within two business days of receipt of payment. You will be notified when your item has been shipped. We are not responsible for shipping and/or delivery delays resulting from acts of nature, thief, strikes, or shipping company errors affecting the shipment and/or delivery. This shipment is fully insured..
We ship world-wide fully insured by: UPS, FEDEX, BRINKS, Private Courier, and United States Express Mail. NOTICE: International shipments are shipped at the customers risk to shipping delays, international and national regulations, Customs fees, taxation, and damage due to and/or resulting from shipping. We are not responsible for shipping delays, damage, theft, acts of nature affecting the shipment, Customs duties, fees, taxation or regulatory import restrictions. This disclaimer applies only to shipments outside the United States, and does not apply to shipments within the United States. Arrangements must be made for delivery to PO boxes. Provide a physical address, and contact phone number with your payment. If payment is made by PayPal, and your shipping address is different than your confirmed address in PayPal, you must contact us directly to let us know of the requested change. Address change approval will be sent to you, otherwise this item will be sent to your confirmed PayPal address. SANT BLANC is a Swiss Timepiece Specialist Company, located in Branson Missouri USA. The Sant Blanc Service Center is a state of the art service facility, servicing all Swiss Made watches and is open to our customers by appointment. The Sant Blanc Sale Division specializes in offering the finest Swiss Made Timepieces. Notice: SANT BLANC is not an official nor an authorized dealer for any product offered or sold and SANT BLANC has no affiliation with the manufacturer. All brand names and trademarks are the property of their respective owners and are used for identification purposes only. SANT BLANC is the sole warrantor. the demanding warranties no longer apply. Rolex is a registered trademark of Rolex Watch USA Inc. SANT BLANC is not affiliated in any way with Rolex.